Former World Team member Dane Lewis re-emerged after nearly a year away from racing Sunday to win the inaugural San Francisco Inline Marathon. Lewis, 30, of Sacramento, looked like a non-starter at the beginning of the race, which attracted a strong field of 30 pro-men skaters, including teams from Bont, Hyper and Simmons Racing. Wearing a warm-up jacket and listening to an iPod, Lewis settle into last place at the start of the race on a fog-chilled road course that had the Golden Gate Bridge as a backdrop. Dane Lewis pulls away from the pack as he chases the breakaway of Norm Kirby and Ricky Blas. But after several laps of malingering, Lewis took off his jacket, unplugged his earbuds and got down to business. He quickly caught the lead pack, then led a multi-lap effort to catch a breakaway by Bont's Norm Kirby. Finally, after 25.5 miles of racing, he lead out his own sprint (he was skating without a team) and pulled ahead of the pack to finish nearly a second in front of second-place Ryan Chrisler. Hyper's Jon Elliott finished third. Three member of the Bont North America team controlled the smaller women's race from start to finish. The team of veteran racers Helen Havam, Debbie Rice and Jilleanne Rookard stayed with the seven-women lead pack throughout the race. They traded pulls at the front with the two Hyper skaters (Peggy Girgenti and Jennifer Hladki) and the two independents: Shannon Scharff of Post Falls, Idaho, and 16-year-old Nastassia Hamor, who won last year's Napa Valley Inline Marathon. Occasionally, the Hyper women tried to get away from the pack and establish a lead that would allow them to hold off the fast-sprinting Bont team at the end. But the Bont women wouldn't let anyone get away and eventually, the seven women arrived together at the final turn, 500 meters from the finish line. Jilleanne Rookard leads the Bont women around Hyper's Peggy Girgenti (left). At that point, the women slowed down, standing up on their skates, and looked around at each other, waiting for someone to start the sprint. Scharff took the bait. But Hyper's Girgenti quickly shot around her to take the lead. "She came out of no where and went past us," Rice said. "But then Jilleanne took off, and we all went with her." The Bont women passed Girgenti in a bunch on the outside: Rookard, first; then, Rice; then Havam. They finished in that order to take the top three spots for women overall and the top spot in the pro master women's division (Rice). Girgenti finished fourth overall; second in the master's division. Like the women's race, the men's was expected to come down to a battle between the Bont and Hyper teams. But then Dane Lewis showed up, and all bets were off. Lewis has been one of the top U.S. inline racers, both indoors and out, for more than 10 years. He was a member of the U.S. World Team in 1998, 1999 and 2006. Last year, he had limited success at the World Championships in South Korea. While USA's Joey Mantia raked in the golds, Lewis managed only one medal: a bronze in a relay (anchored by Mantia). He finished his 2006 season with a fourth-place finish in the Northshore Inline Marathon in Duluth, MN, and hasn't raced since. Instead, he has devoted himself to improving his technique in an effort to take his skating to a higher level. "My goal is to make the U.S. team next year and win a gold medal at Worlds," he said. 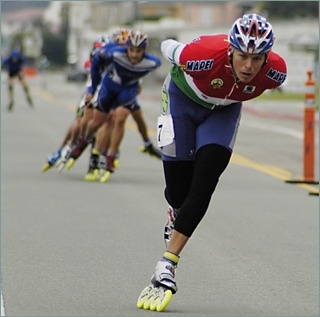 Working with a coach in Sacramento, he has been concentrating on lowering his skating stance, in order to increase his power, he said. He is also working in the gym to build his upper body strength and making the transition to 110mm wheels. After 11 months without a race, he chose the San Francisco Marathon as his reentry point. "After not racing all year, I was a little nervous," he said after the race. "But I felt good." At the start of the marathon, it appeared that Lewis was not interesting in winning. Off the line, he settled into last place for a time before moving up to the back of the large lead pack (about 15 skaters) that formed at the start of the race. The pace was slow with the Hyper and Simmons skaters doing most of the work at front. A stiff headwind blew down from the Golden Gate Bridge and made the going tough on the westward portions of the road course. On lap 7 (of 17), Bont's Norm Kirby took off on a breakaway with teammate Grant Foster slowing the pack behind him. By the start of the next lap, the 40-year-old Kirby had a lead of nearly a minute. Near the start of the eighth lap, Hyper's Ricky Blas took off after Kirby while the chase back, now slowed by both Foster and Hyper's Jon Elliott, continued to lag far behind. Finally, Lewis seemed to come to life. He shot around to the front of the chase pack and pulled ahead. Meanwhile, a third of a mile ahead, Blas caught up with Kirby and the two started working together to maintain their lead. But they couldn't hold it. The chase pack caught Lewis and started gaining on the breakaway. With Lewis providing strong pulls, the chase caught Kirby and Blas after three loops of the 1.5-mile road course. From then on, the men's pack, whittled down to seven skaters, stayed together. Bont's Foster appeared to sacrifice himself, taking pulls into the wind on the last two laps. After an hour and 19 minutes of skating, the seven racers approached the final turn and Lewis started sprinting for the line. "I had picked my spot and when I got there, I just took off," he said. Ryan Chrisler, 34, of Wichita, Kansas, stayed with Lewis but could not catch him, and in the end, Lewis stood up and raised his arms in victory about 15 meters in front of the finish line. His time was 1 hour, 19 minutes and 10.067 seconds. Chrisler finished nine-tenths of a second back to claim second. Elliott finished another four-tenths of a second back to take third. Lewis and Rookard, the women's winner, both earned $550 for their wins. The marathon had three separate starts: recreational and fitness, pro men and pro women. No cross-drafting (women drafting with men and visa versa) was allowed. Mark Nelson Jr., 16, won the recreational marathon in a time of 1:31:24.710. The event was organized by the Savant Group, an investment advisory firm. In all, 98 skaters participated.